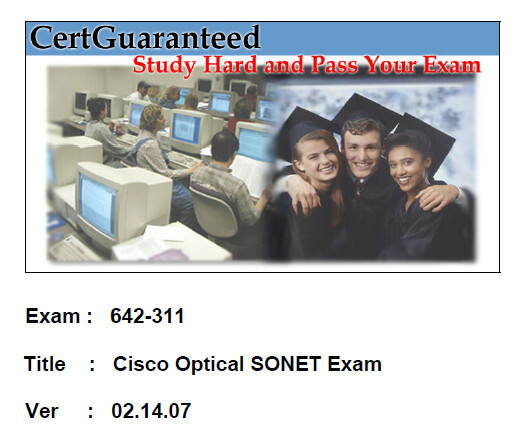 This is the Exam 642-311 with subjectCisco Optical SONET Exam. Download this exam sample to help your CCNA exam. The answer for each question already provided. You can download the file at the end of this post. Scrambling of SONET signals is done to _____. SONET Code Violations (CV’s) totals in the PM tables are actually an accumulation of the number of _____. How is UPSR and BLSR traffic rerouted during a protection switch when a complete fiber cable cut occurs? A. Traffic is switched from the first node receiving the AIS indication. B. Traffic is switched from the far side of the failure, allowing handshake to occur. C. UPSR traffic is switched from the terminating node, BLSR traffic is rerouted from the originating node in the ring. D. UPSR traffic is switched from the terminating node, circuit by circuit. BLSR traffic is rerouted from the last reachable node in the ring.